The terrestrial biosphere absorbs about 20% of fossil-fuel CO2 emissions. However, the land sink is composed of two largely counteracting fluxes that are poorly quantified: fluxes from land-use change and CO2 uptake by terrestrial ecosystems. Dynamic global vegetation model simulations suggest that CO2 emissions from land-use change have been substantially underestimated and that terrestrial ecosystems might have greater potential to sequester carbon in the future. 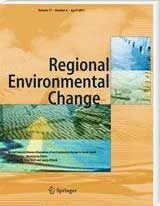 This study results from an international cooperation mainly funded by the National Socio-Environmental Synthesis Center (SESYNC) of the United States and quantifies a national-scale resilience indicator for the years 1992-2011. This indicator is based on three dimensions of resilience: biophysical capacity to intensify or extensify food production, including water resources, socio-economic access to food in terms of income of the poorest quintile relative to food prices, and the magnitude and diversity of current domestic food production.